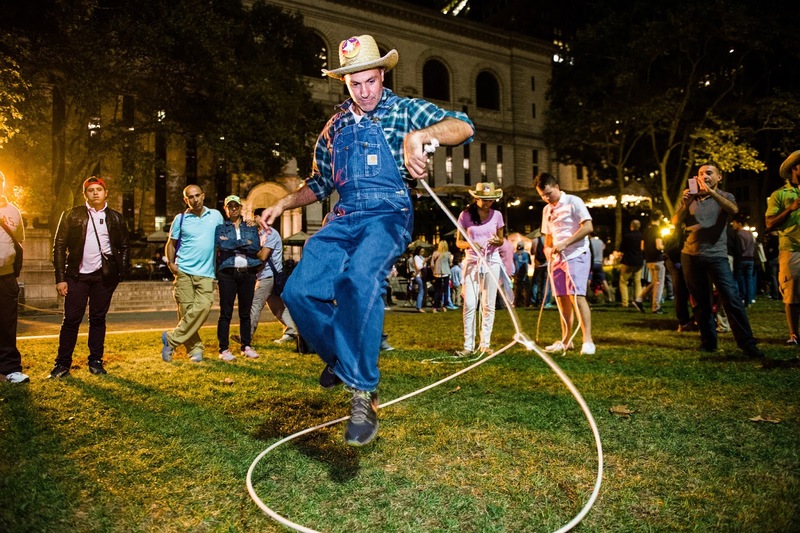 Bryant Park Square Dance is not only a fantastic time to try your hand at the Virginia Reel, or to perfect your trick roping technique; it is also the perfect opportunity to try your hand at a game of chance! We're raffling off a pair of Southwest Air® go-anywhere tickets--yes, you really can choose your destination!--so start thinking of which pardner you'd like to take with you. We also have tons of great prizes from Bryant Park businesses, including the Bryant Park Shop and several of our in-park food kiosks. Did we mention that the raffle entry is free? One entry per person, please. When you win a raffle prize, you'll be jumping for joy! Entry for the raffles opens at the event start time (6pm on Friday, and 3pm on Saturday), and closes at 7:15pm each day. The Bryant Park prizes will be called on-site at 7:30pm, so make sure you stick around until then. Winners must be present to claim their prize. The winner of the airline tickets will be randomly chosen on Monday, September 26 and notified by e-mail (valid e-mails only). The winner will have until September 30 at 12pm EST to claim the tickets. If the tickets are not claimed, a different winner will be randomly chosen, and so on, until the tickets are claimed. Best of luck out there, cowpokes!